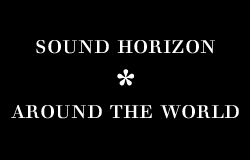 UPDATE: Due to the rotational blackouts scheduled in Tokyo during these weeks, the Sound Horizon Cafe has been cancelled. It will be rescheduled as soon as possible. Moreover, Revo’s stage greetings at TOHO Cinemas in Tokyo, Osaka and Fukuoka have been put off until further notice. Even if the world tries to put people’s stories to an end, we know that is rather a beginning. This is Revo. I’m alive. I suffered the quake while was at the studio working on the edition of the movie. But I beg all of you to keep the imagination and sympathy, and more than anything, the hope. But after many twists and turns I can report that the whole work is completed. The product is already out of my hands (i.e. delivered). I don’t feel like debating about how “just because it is a time like this we need it” or the like. I’m doing what I can do. And that is not over yet. I believe that all of you are doing everything that is in your hands. Please, keep on doing so. I believe that just by being alive, you’re giving strength to someone. PS. It’s a bit late, but thanks for all the Valentine’s gifts. I’ll try keep struggling to give something back, even if it is something that you can’t see with your eyes. We hope that this disaster will affect as less as possible to Sound Horizon’s activity, but above all we want to send a message of support and empathy to the thousands of people who has lost their homes, friends and loved ones in this terrible earthquake. If you want to support in an active way, you can make a donation to the Red Cross. 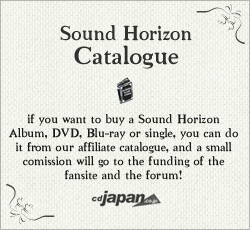 Previous postSound Horizon, first feature of ANICAN-R this month! + SH Cafe dishes and cocktails Next post3D Screening of the 7th StoryConcert has started!